Limited edition of 10 pieces in platinum. CALIBER RM031 : manual-winding mechanical movement with hours, minutes, small seconds and function indicator. Used for the first time on the RM 002, ARCAP is a material that is renowned for its physical characteristics. With its antimagnetic properties and density of just 8.90 g/cm3, ARCAP is almost completely insensitive to large temperature variations and corrosion. These qualities explain why ARCAP is frequently used in the aeronautical, automobile and advanced electronics industries. Another of ARCAP's ideal characteristics for fine watchmaking is its propensity to accept extreme finishing with inimitable results. These components are made from grade 5 titanium treated with a black PVD coating, which gives the whole structure great rigidity and excellent surface flatness, both essential to the perfect functioning of the gear train. 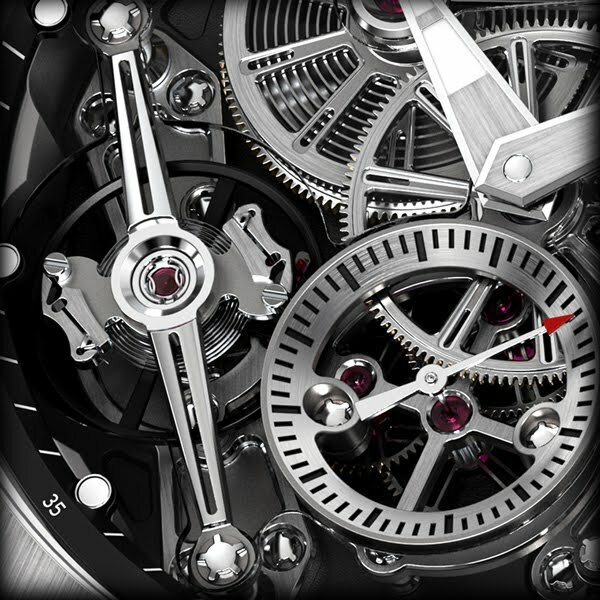 The caliber RM 031 possesses the most advanced regulating mechanism in existence today. Equipped with a variable-inertia balance wheel and a direct-impulse escapement, the RM 031 High Performance guarantees an extraordinarily regular going rate. The movement has a variation of between 0 and 30 seconds per month, offering an accuracy that is four times superior to that of current movements. In a manner similar to a car’s gearbox, the function indicator allows one to see the winding, neutral and hand setting positions as the crown is pulled out. Each position is indicated via a hand at 5 o’clock displaying the following functions: W (Winding) – N (Neutral) – H (Hands). The free sprung barrel of the caliber RM031 is especially created for Richard Mille and guarantees optimal output in the RM 031 High Performance. The balance wheel is equipped with 2 Elinvar balance springs set in opposition to each other thus ensuring the perfect centering of the balance wheel’s center of gravity, irrespective of the watch's position. This makes it possible to set the balance wheel oscillating at a high frequency of 36,000 vph (5 Hz). This particular arrangement also dispenses with the terminal curve of overcoil springs, a curve that is very difficult to create because of the specific conditions needed for them to function completely concentrically. The balance wheel is completed by a four-screw regulating system. The regulator index is thus eliminated. A more accurate and repeatable inertia adjustment can now be made directly on the balance wheel. A subtle combination of a detent escapement and a Swiss anchor escapement, this component enables perfect regulation and timekeeping results. 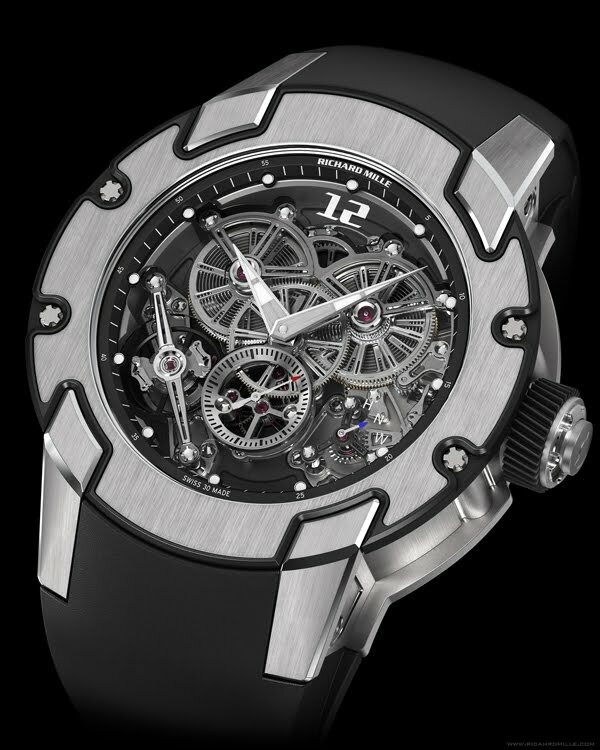 Developed by APR&P for Audemars Piguet, it was chosen by Richard Mille to power the RM 031 High Performance caliber. The AP escapement provides an improved transmission yield thanks to the direct action of the escapement wheel on the balance wheel. A guard pin designed especially for this type of escapement prevents overbanking. The double barrel system helps to improve the stability of torque over a longer period. This is achieved by dispersing the stored energy within two winding barrels, equalizing torque as well as reducing pressure and friction on the bearings and pivots, resulting in improved long-term performance. - It provides an excellent mainspring delta curve with an ideal power reserve/performance and regularity ratio. All the wheels of the RM 031 caliber are optimized by the use of a special profile for the teeth with a pressure angle of 20°. This pressure angle favors rolling and better withstands interaxial differences. These new gear trains ensure excellent torque transmission and hence optimum output. The RM 031 Haute Performance displays a quality of finish that is rarely found in Haute Horlogerie. The finish adorning every component of the movement and case is created by hand. The baseplate and escapement-holder are made of microblasted ARCAP. The angles and lower part of the baseplate are polished, while the upper surfaces of the escapement-holder are straight-grained. The titanium barrel bridges are microblasted with polished angles. 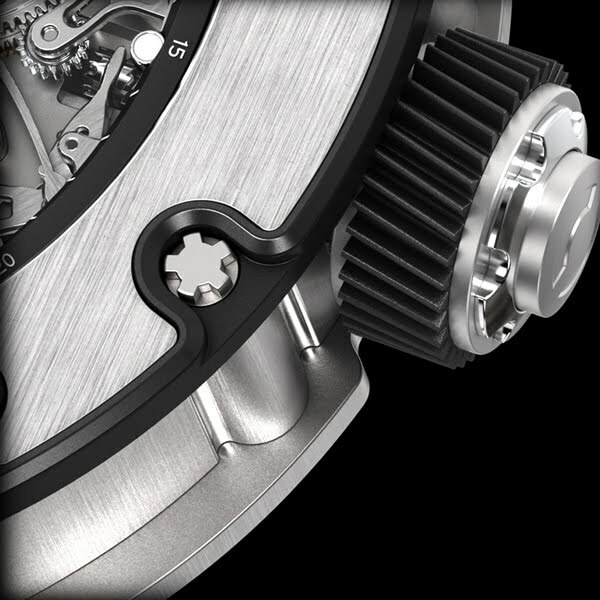 The various bridges that make up the RM 031 are straight-grained above and have hand-polished angles. The wheels are polished, microblasted, beveled and circular-grained. The sections are burnished and the escapement bridges are soft-polished. A PVD treatment is also applied to the parts in grade 5 titanium. The design and manufacture of the watch embody a complete conceptual approach to the case, dial and every part of the movement. 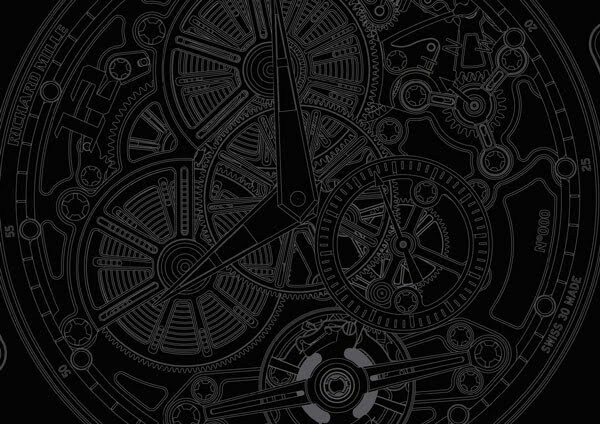 The timepiece is created as a harmonious whole according to extremely rigorous specifications. The casing ring is eliminated, and the movement is fixed to the chassis with three titanium screws and silent blocks (ISO SW). 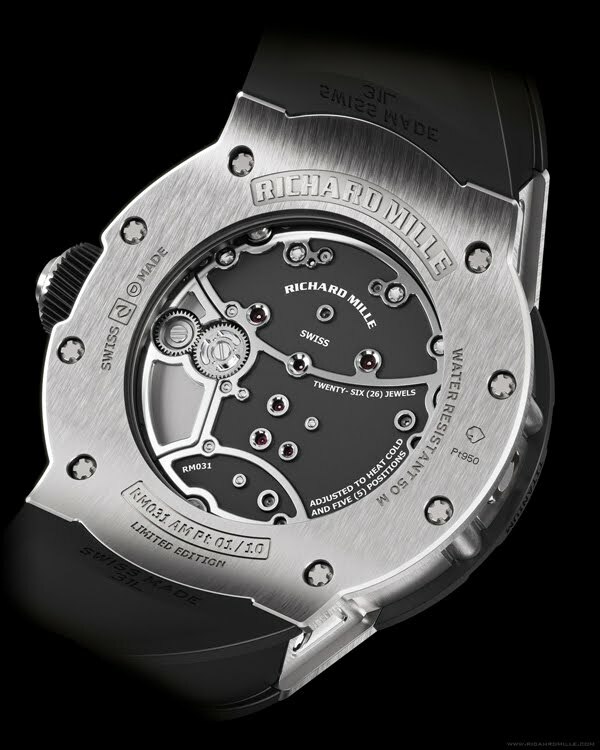 A first at Richard Mille, the case is composed of four parts, and is assembled using 12 Spline screws in grade 5 titanium and wear-resistant washers in 316L stainless steel. The system is completed by the incorporation of the lugs as separate elements of the case design. The case is water-resistant to 50 meters. Upper and lower flanges in DLC-treated titanium; the hour-markers filled with an approved luminescent material. Sapphire crystal (0.40 mm thick) with anti-glare treatment (both sides). Bezel side: in sapphire (1,800 Vickers) with anti-glare coating (both sides). The exterior titanium bezel is entirely microblasted with vertical satin-finished edges and hand-polished angles; the interior platinum bezel is satin-finished on the upper surface and microblasted on the sides. The case middle and back are in platinum. The case middle is microblasted and satin-finished with vertical satin-finished edges, the case back is satin-finished at 6 and 12 o'clock, the sides are polished, the edges smoothed and the Richard Mille engraving microblasted. The platinum lugs are carefully designed to extend the lines of the case while following the curve of the strap.